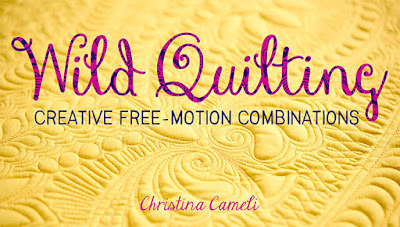 On my first-ever trip to Quilt Market last fall, I developed a complete crush on Jennifer Sampou. Not only was she warm and welcoming to a bewildered newcomer, she has a unique sense of style that looks effortless. Awesome boots, a cowhide bag lined in her own fabric. Mercy. She is that kind of artist-Jedi that makes you feel at ease but inspired at the same time. So I loved it when she asked if I would make something with her upcoming fabric line, Shimmer. Of course it's like Jennifer, natural, classy, and, with the iridescent printing, a little different without being weird. It's subtler than your standard metallic fabric. Touchable. I like it. 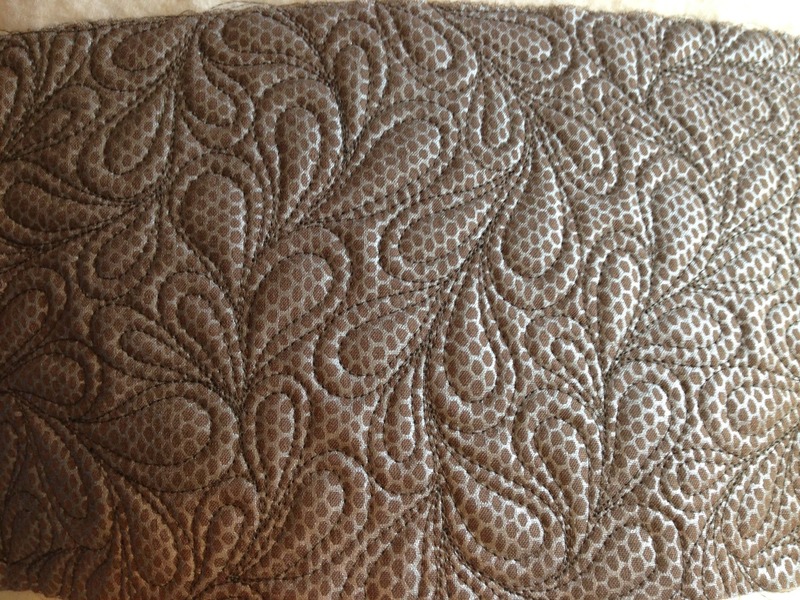 I lucked out that Jennifer wanted me to use her snakeskin fabric. I loved the way it looked quilted and I thought, "Shimmer indeed!" I really want this print in every color now. I made the messenger bag from my book. Jennifer and I each contributed leather scraps for the belt. That was her idea of course! Jedi-level, right? You'll be hearing lots of other bloggers tell you about Jennifer's fabric I think, so I won't say much more. If you're inclined to pre-order it you can do so at the Cotton Patch. 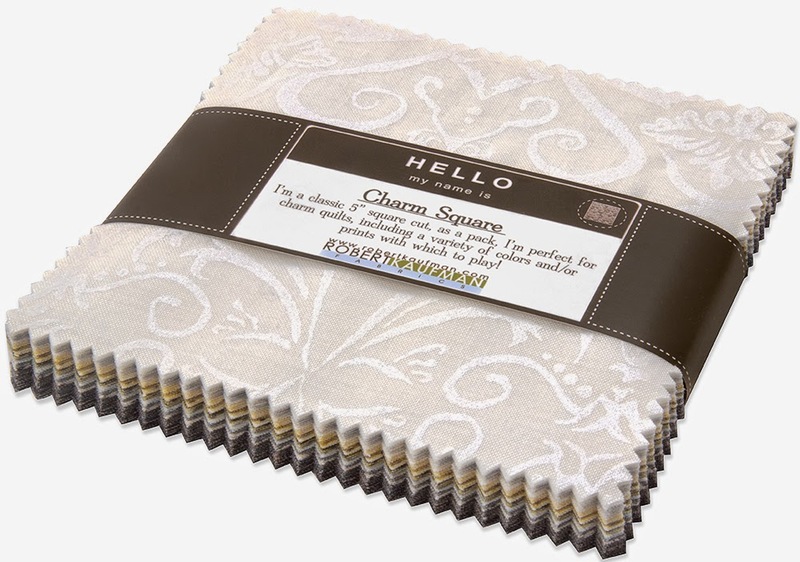 Definitely stop by Jennifer's blog to get entered to win a fat quarter pack of this fabric before her drawing on the 21st. And visit the other participants in the blog hop too, each one of us has a charm pack to give away! 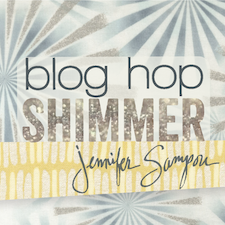 April 21-Jennifer Sampou- Announce Winner of Giveaway FQ Pack of entire Shimmer Collection. So to enter the giveaway for the charm pack, leave me a comment below telling me about something beautiful you've seen recently. Mine: as I type this I'm watching drops of rain sparkle in the cedar tree after a rainstorm. I'll draw a winner at random, after April 14th. Thank you to Jennifer Sampou and Robert Kaufman for the giveaway! I saw a beutiful sunrise this morning, the sky was all shades of pink. Together with lots of birds chirping, it was a perfect start of the day! we are beginning to have some lovely spring days in idaho! the nasty winter surely makes you appreciate the spring as it pops its head out here and there! thank you for the giveaway! I saw the most excellent woodpecker. I think it was a Downy Woodpecker. The bars of black and white on his back accentuated with that intense pop of vivid red on his head really shimmered in the sunlight. Right now I am looking out my window at the sunshine!! We have had such a long, very cold winter here in Iowa that the sunshine has to be the most beautiful thing to look at right now. Thanks for the giveaway. Something beautiful ~ it's all around right now ~ beautiful flowers, birds singing, trees leaving out and the air has a lovely quality to it, warm but still a bit cool. 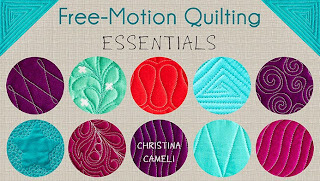 Thanks for the giveaway ~ amazing quilting and lovely bag! 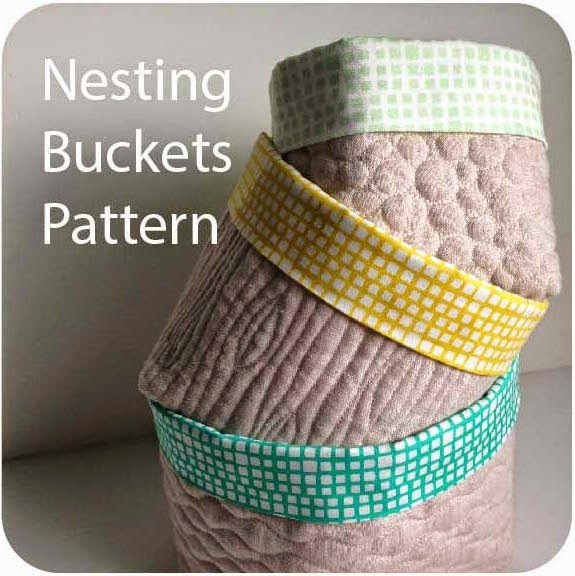 Nice projects and love the fabric! Love the projects and the fabric is beautiful. I am seeing a beautiful sunrise as I speak. Fabric looks great as well. That bag is delightful and love the minimalist design on the front combined with stunning quilting! I saw a double rainbow for the first time ever on monday evening up here in Hull, East Yorkshire.....it was stunning! The sky was heavy with rain and a magnificent bold grey, but then seated in front of the low cloud was a doube rainbow with glistening colours seeming quite low and almost touchable. I saw a beautiful young magpie yesterday, with shiny greenish black feathers! A beautiful sight I have the pleasure of witnessing every day is the little sprouts emerging in the greenhouse. I had a lot of seed catalogs getting dusty this long winter. Cute bag! Thanks for the opportunity to win! Something beautiful right now is the sun. It is finally a nice sunny day after a long cold winter and spring. Thank you for the chance to win. Matsche.christine@yahoo.com. I saw the snow that has been on my deck like forever melt today and be gone!!!! Something beautiful I saw recently was this week when blooms started opening up. Finally spring! I saw a Crocus blooming - a beautiful sight after the long winter we have had. Thanks! My senior dog sleeping peacefully on the floor next to my desk. She has a nice cushion to sleep on but always manages to have her head hanging off the edge, silly girl! Love that messenger bag and the fabric is pretty, must be just amazing in real life all shimmery rich! A beautiful sight was seeing a big smile on my neigbour's face when I gave her the lap quilt I made for her 80th birthday! One of the most beautiful things I've seen this week is my sister's new cat, Sage. He is just gorgeous! Wow, I really like your messenger bag! When I finally made it in to my sewing room this morning, the sun was shining through the window right on to my sewing machine and the fabrics I had pinned together last night. It was as if the machine was beckoning to turn it on and work. Of course I took a few minutes to sew some seams before heading back to the kitchen to take care of the breakfast dishes and start load of laundry! It seems that winter has dragged on for so long and this morning, the sun was such a beautiful and welcoming sight! The grass! It may be brown and the lawn may be muddy, but I see little bits of green peeking through and no more snow piled higher than a car and it is beautiful and Spring is finally making an entrance! great bag. I saw a bunch of wild violets along side the road. a pretty blanket of purple. thanks for the giveaway. I just saw your beautiful quilting with the new shimmer snakeskin fabric and the bag you made also so that's what I saw that was beautiful!!! Our local Botanical garden has a beautiful tulip display of over 56,000 tulips and daffodils. Jennifer is so awesome. I love everything she does. i'm entering as Mrs. Hopeful! two nights ago i went outside and the stars were just shining so brightly - absolutely beautiful. please enter me in the drawing! All the beautiful flowers around here are finally blooming! Spring is here! I love this fabric! We had an air show in my area last weekend. I love how beautiful the Blue Angels are when they are performing. Whan an awesome experience! great messenger bag - love the addition of the leather strap. On my way to and from work I have a section of street on a hill that is lined with cherry trees. The trees are covered in blossom and were looking gorgeous against the bright blue spring sky we had yesterday. Wow that bag is FANTASTIC!! it is Springtime in central TX and that means the highway medians are blanketed in wildflowers including the state flower bluebonnets. All courtesy of Ladybird Johnson's goal to beautify the area. All of our snow has melted and I saw the sweetest little purple flowers poking out in someone's yard on my walk to work. Your bag is wonderful. Hi!!! I love your bag!!!! Great idea to mix the snakeskin with leather!!!! I love seeing the grass get a little greener each day!!!!! A great messenger bag using Jennifer's line. 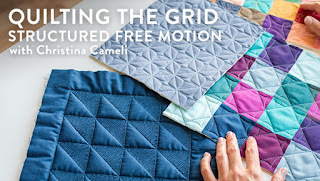 I really like how your quilting mirrors the applique shapes. Something beautiful I have seen recently, other than your bag, is my amaryllis flowers this morning. Two stalks of four blooms each are fully opened this morning. Gorgeous! I know amaryllis are supposed to bloom mid winter but mine bloom in mid April and mid November. Twice a year more than makes up for the lack of blooms in January. Thanks for offering this giveaway. Love the shimmer, nice bag! Some things beautiful I see currently: our twin flowering cherry trees, blossoms appearing on our apple tree, our newly leafed-out birch tree, and the columbine flower stalks growing taller each day throughout the yard. The blessings of Spring! I am so glad to have discovered your blog via this blog hop! The Shimmer fabric line is refreshing and I love the organic feel to the colours and patterns. My daughter sent me a photo of the Spring flowers in bloom in Victoria BC (Canada) yesterday - so beautiful !!!!!! 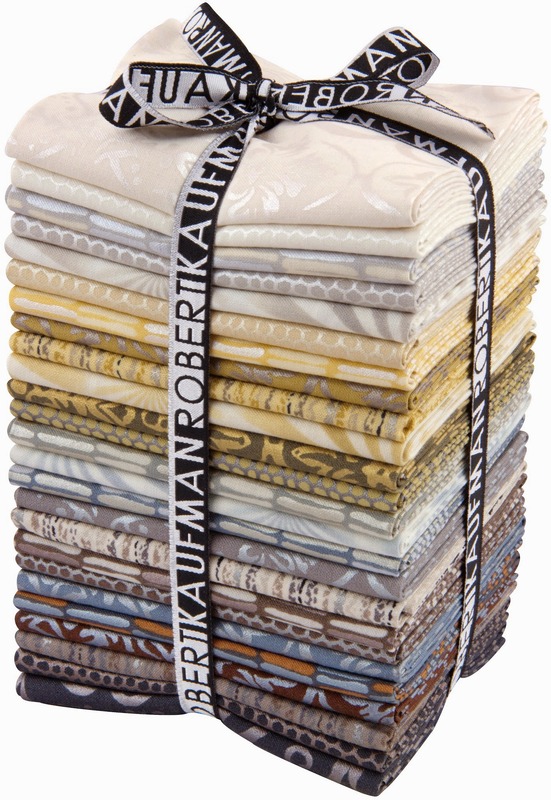 I saw multiple beautiful quilts posted on-line for the Mennonite Annual Relief Sale in Hutchinson, KS. They have a showing and auction that I am looking forward to attending. These ladies do the most beautiful handwork! The field across the street from us is starting to green up. It looks so beautiful after a long long winter of snow. 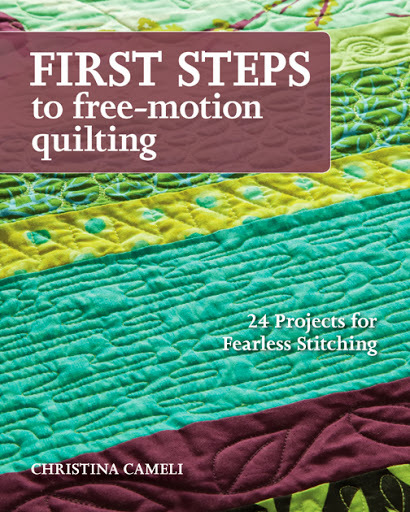 Reading sewing blogs is my only way of staying calm until he arrives :) Thanks! My flowers are starting to come up and bloom! The sun is actually shining today. What a beautiful day! I saw a beautiful pair of mallard ducks that have returned to our neighborhood after the winter. They show up every spring. The sunset was beautiful last night. It was in the 90's today, so the sunset was red/orange/yellow and wispy. Spring has arrived and my garden has started to grow! Finally the last of the snow melted from my property. I can sit outside and soak up some warm sun again. Goodbye to winter! There is a beautiful field of California poppies in town, and I love driving by and seeing that sea of orange, against the backdrop of spring green grass. The Willow tree that is near my work blowing in the breeze welcoming spring after this hard winter. The tulip trees( Magnolia) here in British Columbia are bursting into bloom today, matching the lovely cherry blossoms and daffodils.It is eye candy for us visual quilters, who love colour and nature. My son came home for spring break. He teaches special needs kids in South Carolina. He is beautiful to me , inside and out. It's flowering tree season here in VA - there's beauty all around! Here in Maine, Mud Season is definitely here--but today I noticed that some of the deeper puddles are drying up. Spring, DownEast! Here in south central Kentucky the temperature is in the low 70s, the sun is shining, a mild wind, and I can see new life in the holly bush outside my window! Love Spring!!! I saw a pair of bluebirds playing in the parking lot as I was leaving work the other day! This made me smile and was a happy way to end a long day! While looking out my kitchen window this morning waiting for my breakfast to finish warming I looked toward the brush pile in our yard. I saw movement near the pile and then all of a sudden a bunny popped out. I am happy to see her back again because I love watching her hopping around our yard and it also means she's made a home in that brush pile again this year. Out of that home in about a month, usually around Mother's Day she will appear with all her little babies she has in our yard every year. I really like watching her and the babies because they are so graceful as they hop and are just beautiful. After visiting an acquaintance in Palliative care got outside to see a pastel sunset over looking the channel. Sunsets are usually more vibrant on that speck of water. It was so calming. I saw my first purple miniature iris as I was walking to get the mail this afternoon. I have been in awe for the past week at all the dogwood trees in my neighborhood. For trees that are relatively boring most of the year, they are stunning while in bloom. I can't get enough of them. Maybe it's OK to be boring for 50 weeks of the year if you can be that stunning for the other two. I think the trees and flowers in bloom and that spring is finally here is a beautiful thing. My daughter pulling herself up to standing for the first time. Is there anything more beautiful than watching your children grow? This is my first time here, love your blog. Thanks for the chance to win. I LOVE what you did with your free motion stitching on the messenger bag. I'd say the something beautiful is the sweet yellow crocus coming up on my front lawn. Not sure when the tulips or oter bulbs will come up, but I'm loving the brave crocus. I saw a double rainbow the other day. It was huge! I have four bluebird eggs in the nest in the backyard. I keep pulling up the picture just so I can smile! I loved seeing a CLEAN basement that my husband worked so hard to do. Besides the beautiful sparkly smile of our Grangirlie who stayed with us all last week...we have Crocus & Snowdrops blooming!! The Daffodils will be popping ope in next few days too!! Spring is Beautiful!! Ahh something beautiful of late. Spring is starting to show its head where I live and there is a pair of cardinal birds that grace the evergreen tree in front of my home practically every day just to give me a glimpse of their beauty. We have lots of beautiful humming birds at our feeder right now. I went to the wake of a young person tonight. His friends, teammates and family celebrated his life. He was always smiling and was a kind soul. I was amazed at the joy each person expressed. Beautiful. After a long, very cold winter, I was delighted to see some crocus peeking out of the ground. Maybe spring has finally come! Beautiful quilting on your messenger bag. I've been seeing some beautiful sunrises the last few days. Thanks for the chance to win. My granddaughter taking first place in state gymnastics competition in har age/division. Something beautiful...hummingbirds at the feeder on my balcony on b lovely SoCal day. My dogwood tree is in blossom as is my cherry tree..... Gorgeous. The moon peaking through the clouds, on my way to the store. Colorful birds coming back after a long winter! Where we live we don't get ice storms, but this year we got a couple of them. It was very amazing to see how it formed around things. It would collect on my rocks in front of my house and build up in layers. You could see the different layers. As it rain on different days. That was so beautiful. I love your messenger bag! Looking out of my window the sun is shining, the trees are green and all my children are at home - what could be better?? This is the time of year where there are many trees in bloom. The blossoms don't seem to last long but they sure are gorgeous right now! 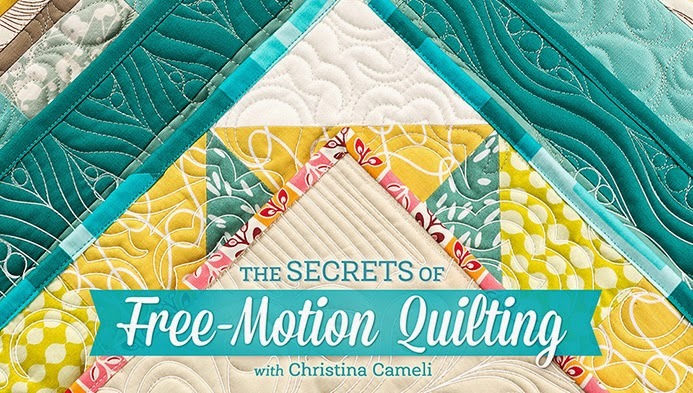 I am loving the quilting you did on the messenger bag! Fabulous bag! thank you and have a great weekend! Seeing my newborn Granddaughter grow , she is 4 mo and really cooing and talking to us, and smiling and she has the cutest round cheeks. I like being clever too! I love seeing the tulips bloom at this time of year. They're very beautiful. Beautiful things...all the signs of spring in my yard. I went outside the other day to get the mail and saw some beautiful tulips pushing up through the ground and blooming. It seemed like it happened overnight and the yellow was dazzling! Thanks for the giveaway, these are some beautiful fabrics! I was just looking outside at all of the beautiful flowers and lush green grass in the evening sun. It's beautiful! I love your messenger bag. The redbud trees are blooming in Middle Tennessee right now - such a beautiful harbinger of Spring! PS Love the quilting on that messenger bag!! Beautiful time of year...watched kids (baby goats) kicking up their heels in pens at local farm! I saw another morning and some sunshine sprinkled throughout the day. Humming Birds have returned so they are beautiful! I saw the most beautiful cactus blooming in full glory. The woods in the sunshine out my window this morning, I think spring is finally here! The moon peeking through the clouds on a chilly spring evening! Something beautiful I'm seeing right now is sunshine, and lots of it, coming through every window this morning! I've been waiting impatiently for spring to really, truly arrive in Oregon, and now it's here....I think! Love the messenger bag, and the Shimmer fabric is pretty awesome! Something beautiful I saw yesterday was the last little pile of snow melt. Also another patch of crocuses popped up behind my garage. Beautiful things everywhere! Loved the early morning light on the tree trunks in the woods the other day! Something beautiful is the promise of spring-I think our snow is finally all gone! Great bag you made! My bleeding heart (plant). It's in that perfect just bloomed enough to be gorgeous, but nothing has died yet. Nice bag and interesting fabric to work with. Loving the shimmer fabrics. 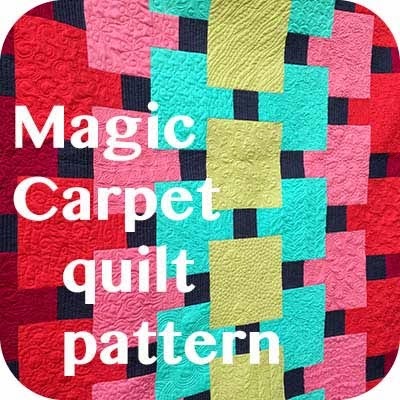 Perfect for a quilt I've been planning for my living room. This Quilting on this Purse is beautiful to me.. I saw my Mum's tulips and they have the most beautiful shade of colour. Nature is so creative! The prettiest thing I've seen lately is the combo of redbuds and dogwoods blooming outside my sewing room window. Thanks for the giveaway! Sunshine, daffodils, red bud trees, deer, baby girl smiling as she is strolling for her first spring. sunshine, daffodils, red bud trees, deer, robins, baby girl strolling for spring stroll. Walked around my yard this afternoon checking out the new daffodils and tulips that are just starting to bloom. So fresh and pretty. I've seen pictures of my precious new grandson! Spring flowers popping up. Thanks for sharing your project, I love it! We had a surprise when we got up this morning. - 5 inches of fresh snow!! April 14 - yikes. BUT - it is BEAUTIFUL! Sticking to the trees & everything else. A sight to behold. Hi Christina, it is a beautiful sunlit day here in Montana and we are just beginning to see an ocassional wild purple crocus appear>so pretty! Great bag! Recentlly, I saw a nest of baby starlings. So sweet! My cousin sent me a picture of the crocuses blooming in her yard - I love the deep purple and I have no yard at my apartment, so I have to live through her! Thanks for the give away!